May 27, 2008: Imagine a billion-ton cloud of gas launching itself off the surface of the sun and then ... doing a cartwheel. 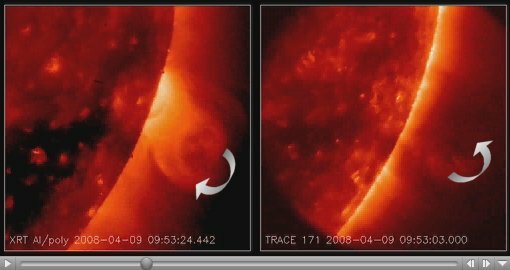 That's exactly what happened on April 9, 2008, when a coronal mass ejection or "CME" pirouetted over the sun's limb in full view of an international fleet of spacecraft. Even veteran solar physicists were amazed. But that's not all. While one part of the cloud did a cartwheel, another part did a backflip at the same time. As strange as it sounds, this could be the normal way solar explosions unfold, say researchers analyzing the data. "What a rare and exciting observation," says Ed DeLuca of the Harvard-Smithsonian Center for Astrophysics (CfA) who announced the findings at the American Geophysical Union meeting in Fort Lauderdale, Florida, on May 27th. "It is showing us the secret inner workings of a process called 'magnetic reconnection' central to solar flares and CMEs." Above: A solar explosion spinning two ways at once. The cartwheel is particularly vivid in a high-contrast XRT movie: play it! These videos reveal a billion tons of hot, magnetized gas twirling at speeds in excess of 1000 km/s. The cartwheel (left; recorded by the X-Ray Telescope onboard Japan's Hinode spacecraft) spins one way while the backflip (right; recorded by UV cameras onboard NASA's TRACE spacecraft) spins the other. How can an explosion spin in two directions at once? DeLuca explains: "We think we are seeing a twisted 'flux tube' of solar magnetism unfurl. One end of the tube spins clockwise, the other counterclockwise." This unfurling action pumps energy into the explosion, heating the CME and propelling it away from the sun. To better understand the process, rummage through your desk and pull out a rubber band. Hold one side of the loop between the thumb and forefinger of your right hand; hold the other side of the loop with your left hand. Stretch the rubber band taut and start twisting (roll the rubber band between thumb and forefinger). The band becomes tight and knotted and filled with latent energy. Keep twisting, if you dare, until—crack!—the band ruptures, snapping back on your fingertips and making a nasty welt. You've just simulated a solar flare at your desktop. Magnetic flux tubes on the sun behave a lot like rubber bands, researchers believe. They get twisted and knotted and filled with latent energy, until—crack!—the field lines rupture, producing an explosion more powerful than a hundred million hydrogen bombs. Remember the rubber band untwisting as it hurtled back toward your fingertips? There you have the cartwheel and backflip, writ small. The CME, however, was merely the beginning. "The really interesting developments came later," says solar physicist Leon Golub of the CfA. Hours after the initial blast, the ruptured magnetic flux tube began to heal itself. Rubber bands never do this trick, but magnetic fields do because, basically, Nature abhors a broken flux tube. Thanks to the high-resolution of Hinode's X-Ray Telescope, says Golub, "we have witnessed a phase of magnetic reconnection never before seen in such detail." The healing process began with the formation of a tall X-ray spike jutting out of the blast site. "This is a current sheet seen edge-on," says Golub. Current sheets are where magnetic fields of opposite polarity meet and rejoin. Hinode's X-ray movie shows material left behind by the CME flowing back down into the region from above: click to play. The current sheet seems to guide the flow as the area reloads for possible future explosions. 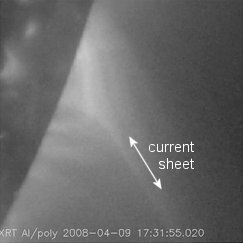 Right: An X-ray snapshot of the post-eruption current sheet. Credit: Hinode XRT. "We were lucky. The solar flare was hidden just behind the limb of the sun; this eliminated the blinding flash so that Hinode could take long exposures of the fainter CME above." How significant are the data? The CfA researchers are planning an entire workshop dedicated to the study of this one CME. They and others will bring together data from a fleet of spaceships including Hinode, TRACE, SOHO, STEREO and RHESSI to gain a more complete understanding of solar eruptions. Their conclusions will go far beyond the sun, however. Magnetic reconnection is a process fundamental to many realms of astrophysics. "It happens in black holes, pulsars, active galactic nuclei, planetary magnetospheres—you name it," says DeLuca. "The sun is a great big laboratory where we can watch it happen." And who wouldn't want to watch a billion-ton cartwheel? Stay tuned to Science@NASA for further developments. Led by the Japan Aerospace Exploration Agency (JAXA), Hinode is a collaborative mission that also includes the space agencies of the United States, Great Britain and Europe. Ed DeLuca of the Harvard-Smithsonian Center for Astrophysics (CfA) is principal investigator for Hinode's X-Ray Telescope, which was developed at the CfA. The Marshall Space Flight Center managed the NASA instrument component integration for NASA Headquarters, is managing the science operations for NASA and is also supporting science operations in Japan.